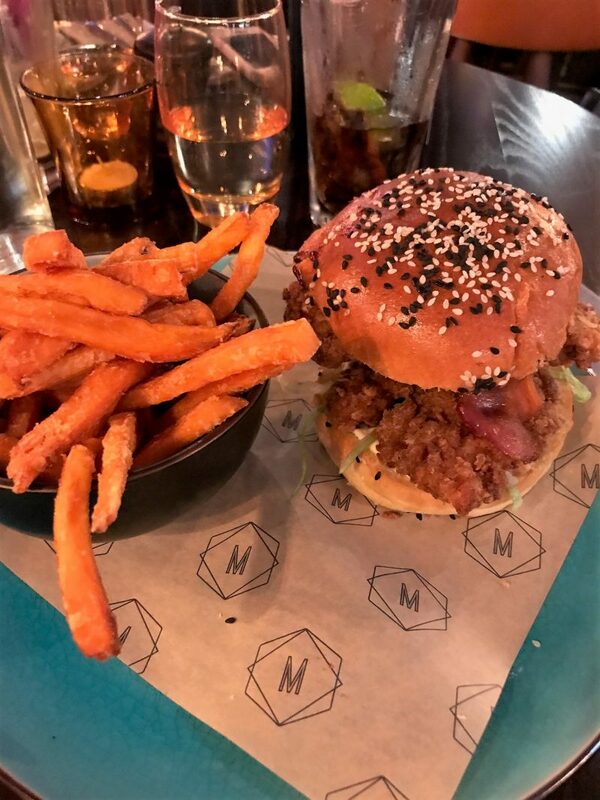 If you’re Manchester based and follow a lot of locals on social media, you may have seen the recent hype around Deansgates newest bar and restaurant, Manahatta. 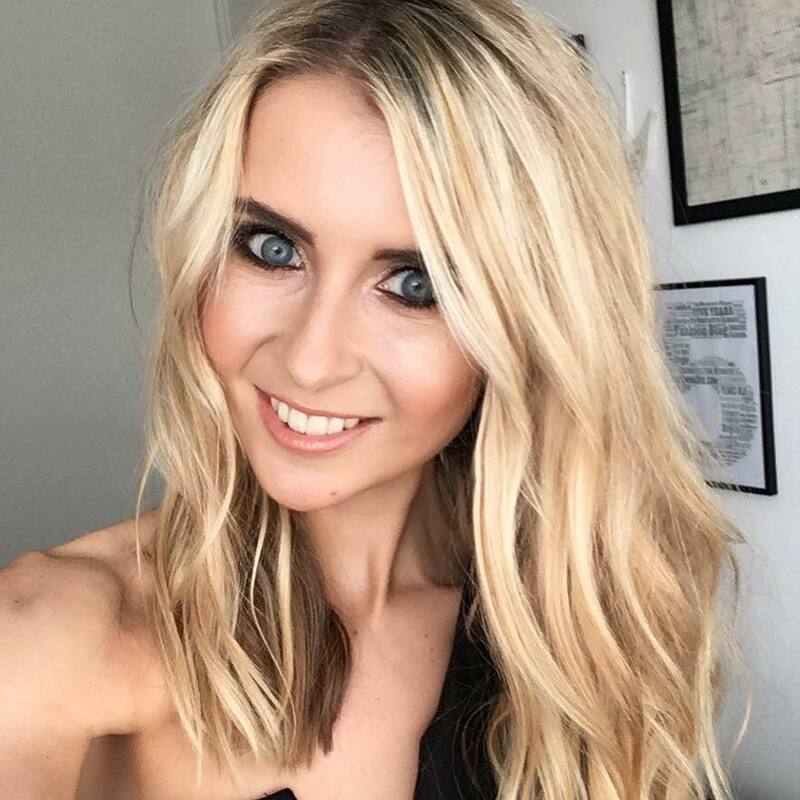 They had an excellent launch party the other month, which saw hundreds of foodies, journos and influencers flock to the New York style venue to celebrate the opening. Sadly, I couldn’t attend, but luckily I was able to visit a week or so after the official launch and try out the menu during a weekday lunch time. I expected it to be slightly quiet, with it being mid week, but boy was I wrong. My 1 pm sitting was surrounded by the hustle and bustle of various groups, couples and work parties all tucking into the menu, and even having a cheeky daytime tipple. Lets touch on the decor and interior first, which is absolutely beautiful. 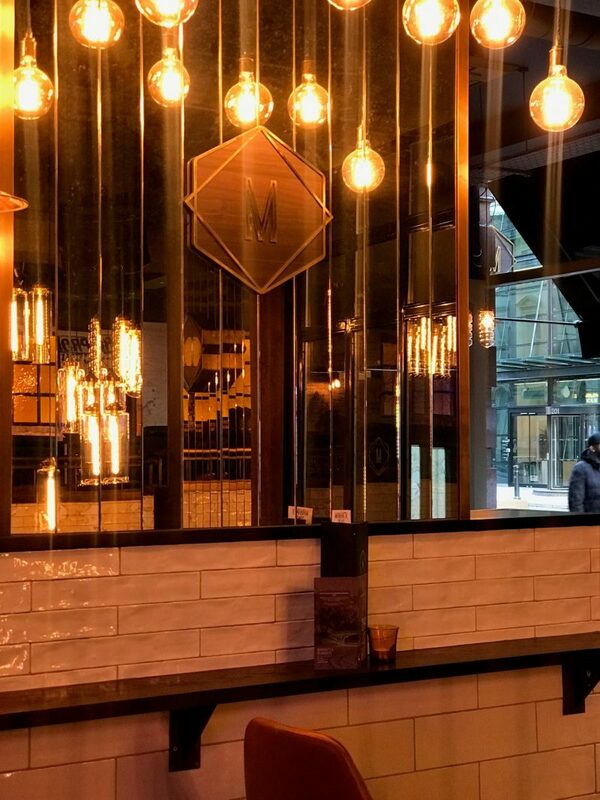 Labelled by some as a party bar, Manahatta is designed to bring a bite of ‘The Big Apple’ to Manchester, and certainly takes inspiration from the city with its interior. 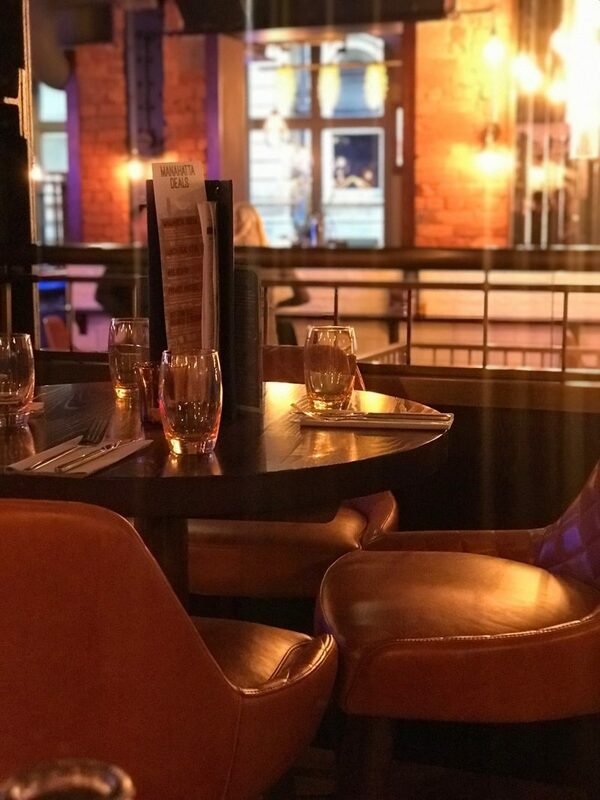 The place sprawls across two floors on the corner of Deansgate and Peter Street, oozing style and sophistication the minute I arrived. 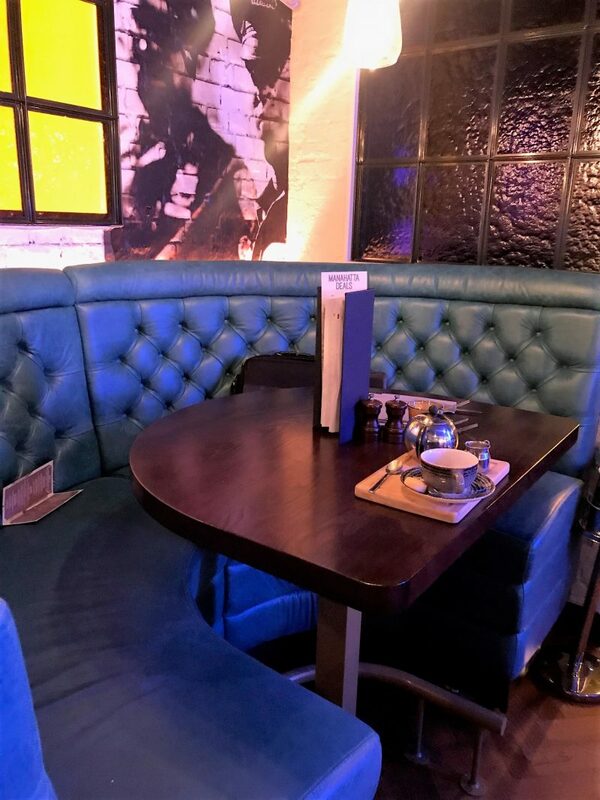 You can still spy the old buildings original features including parquet floors and glazed tiling, brought alive with new touches such as street art murals, neon signs, colourful leather booths and plush velvet seating and a giant swing. 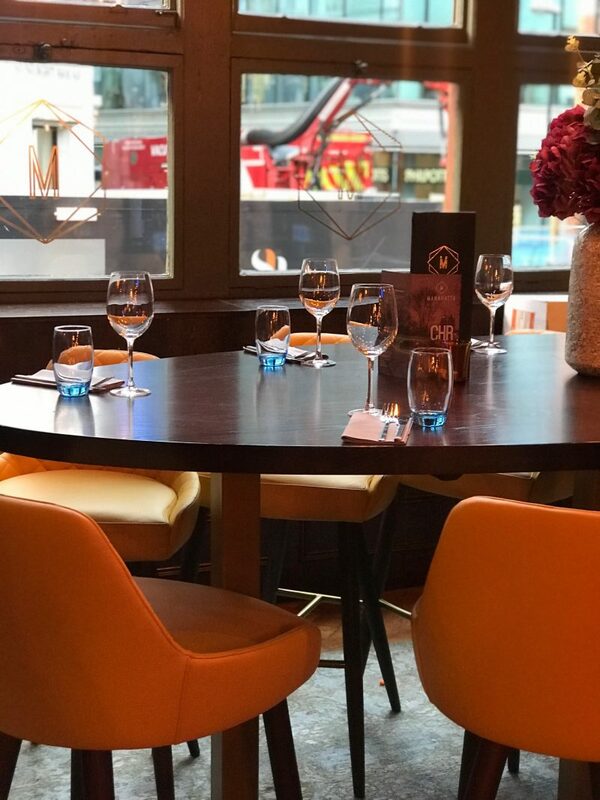 By day, the kitchen will serve up decadent New York-style bottomless brunches and light lunches, followed by a more indulgent American-inspired menu in the evening, which you can still select from during lunchtime hours if you wish. 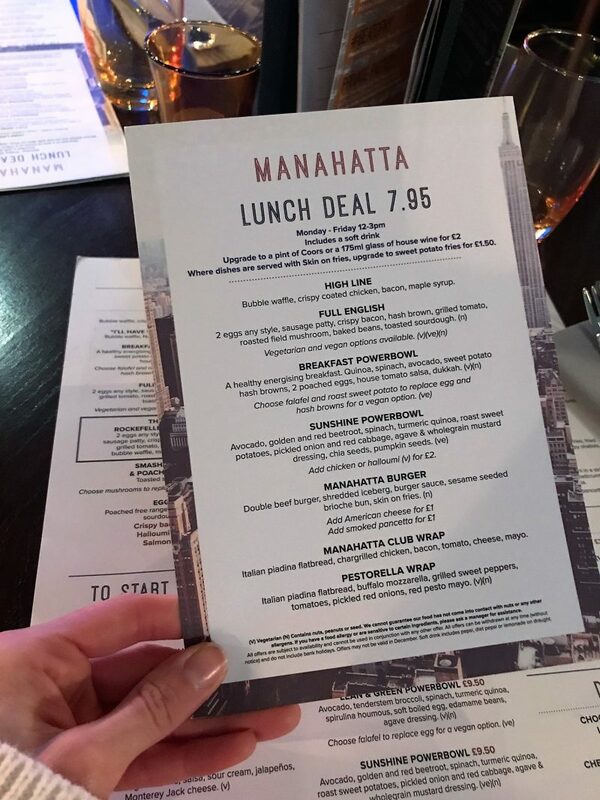 However, they also have a lunch time menu with £7.95 lunch deals, which offer an extensive listing of food options. 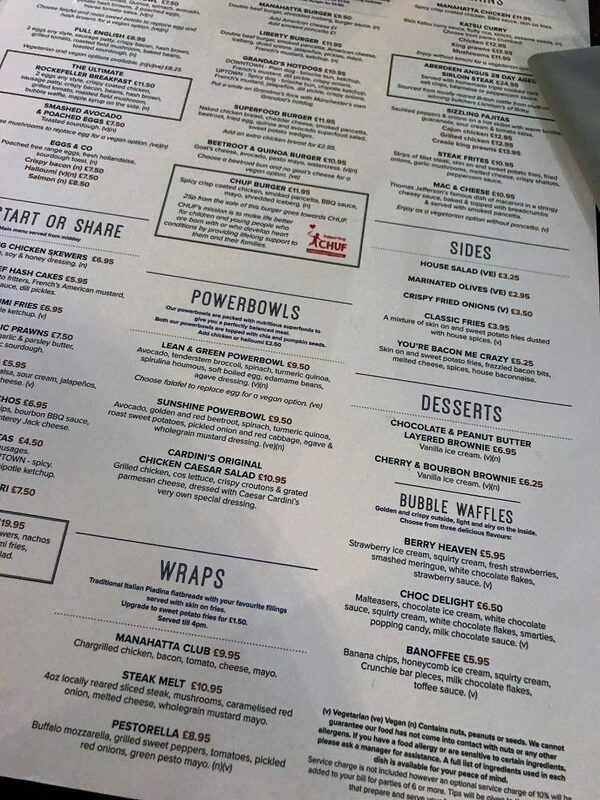 It’s only available Mon-Fri 12-3, but offers the Manahatta Burger, Sunshine Powerbowl, Club Wraps and a Full English to name a few, so there’s plenty of choice. The bar area offers a sophisticated cocktail and wine list designed in collaboration with The American Bar at the Savoy Hotel in London. 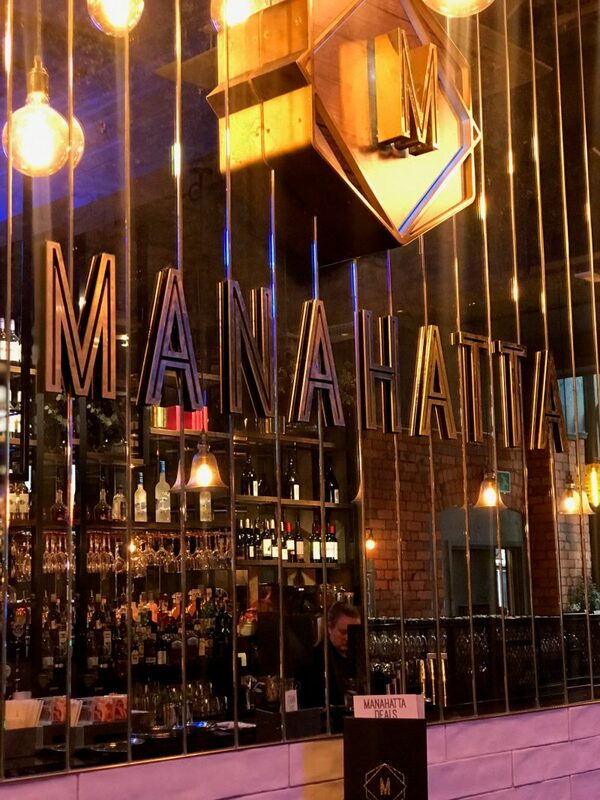 And if you venture to Manahatta during the evening, you’ll usually find a soundtrack of DJs, musicians and other live entertainment taking place including guest acts from around the globe. 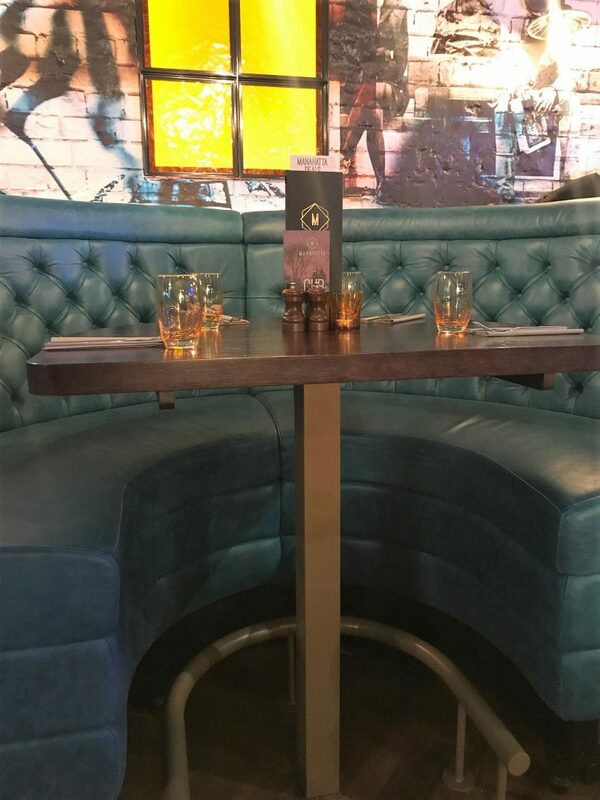 The venue also includes a private room that can be booked for parties, as well as sectioned off spaces and big booths that can be reserved for groups. 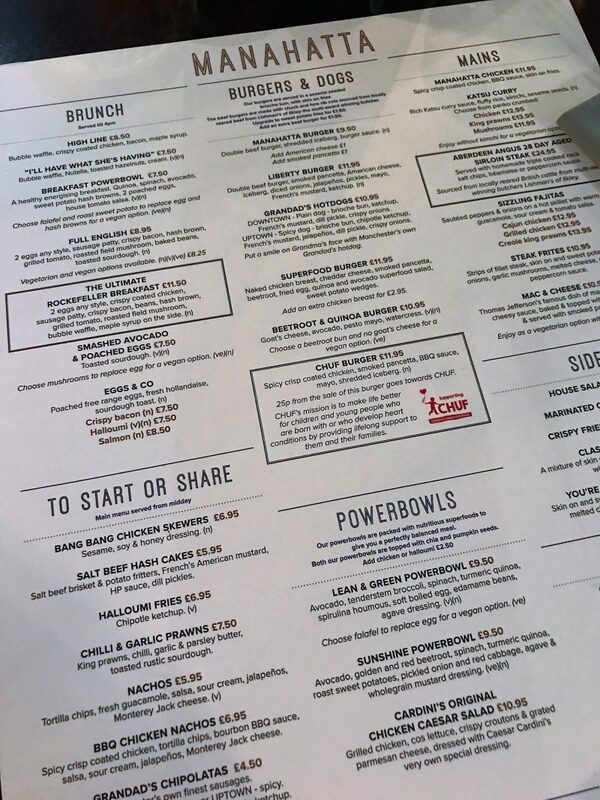 As you can see from the above and below, the menu is a fairly large one, with so many options. I spied a fair few good meal choices from the ‘Mains’ section, however at 1pm on a Wednesday I decided to go for something a little lighter. Saying that though, I still ended up with a burger and sweet potato fries! Some ‘Mains’ that stood out to me and tempted me to return include the Manahatta Chicken and the Katsu Curry (with either chicken, prawn or mushrooms). But it’s the unique listings of Powerbowls that got me interested. Manahatta offer powerbowls packed with nutritious superfoods to give you a perfectly balanced meal. Now I’m not big on healthy eating, but I do love knowing the places I can dine which give me the option. Their powerbowls are topped with chia and pumpkin seeds, and include all the vitamin fuelled veggies. You can add chicken or halloumi to them for an extra £2.50. So, which burger did I go for, and how did I find it? 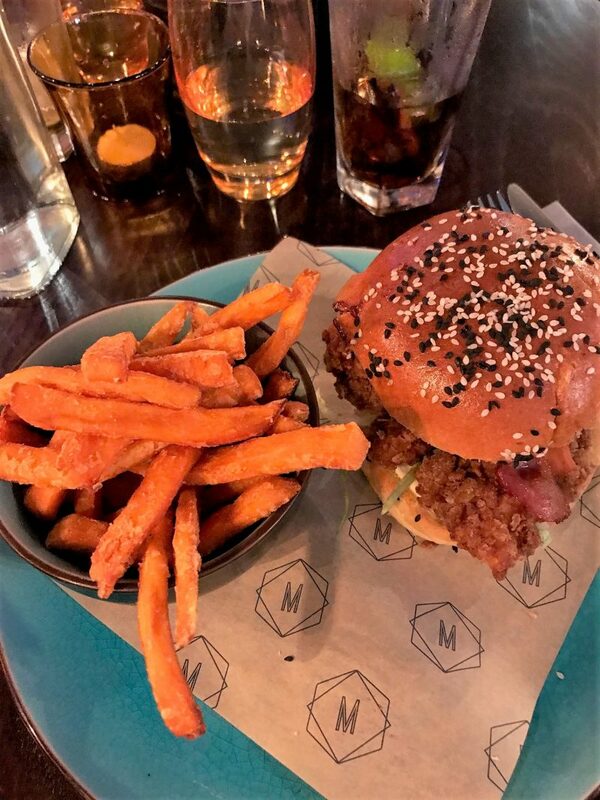 I went for the Chuf Burger, which comes as two spicy crisp coated chickens, smoked pancetta, BBQ sauce, mayo, shredded iceberg loaded onto a burger with sweet potato fries. 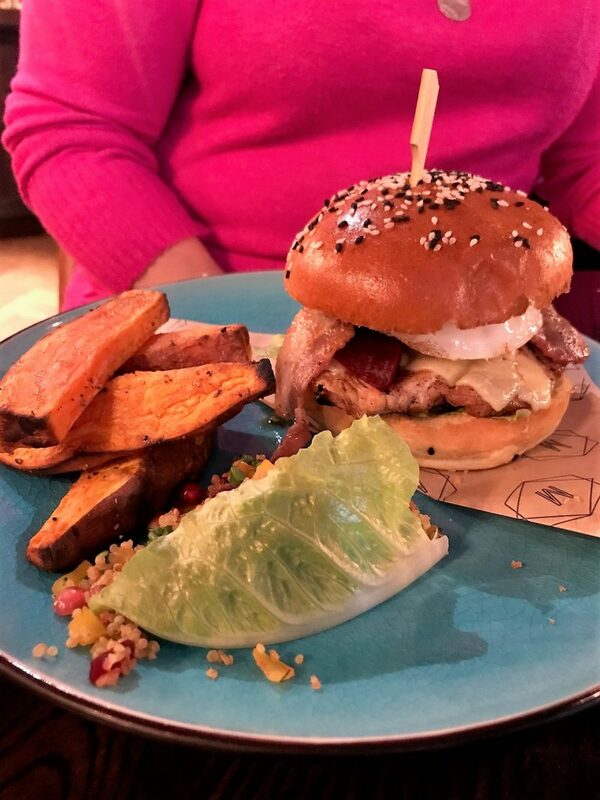 25p from the sale of this burger goes towards CHUF, a charity with a mission is to make life better for children and young people who are born with or who develop heart conditions by providing lifelong support to them and their families. 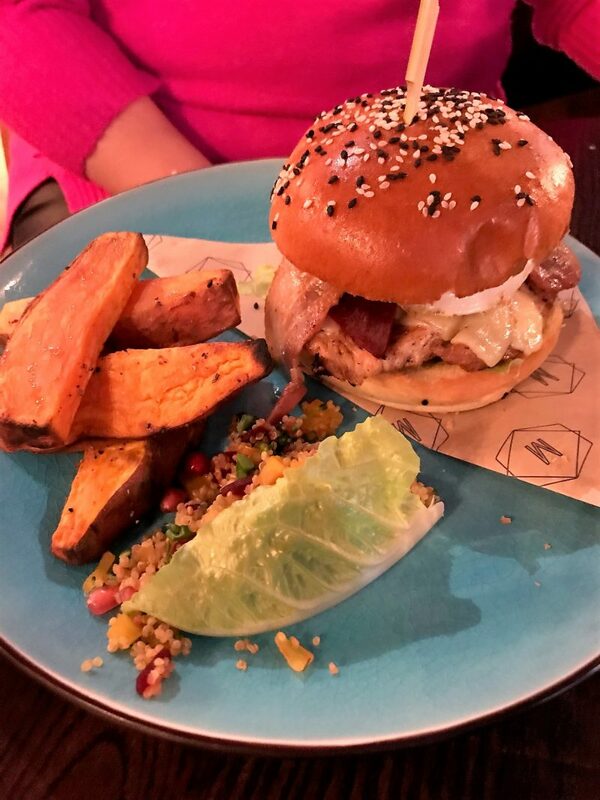 My guest went for the Superfood Burger, a naked chicken breast with cheddar cheese, smoked pancetta, beetroot, fried egg, quinoa and avocado piled onto the bread. The Superfood burger is photographed below (excuse the poor lighting – Manahatta is quite dark!) 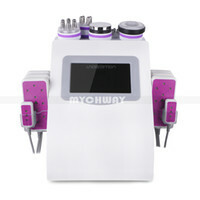 and mine is pictured below. 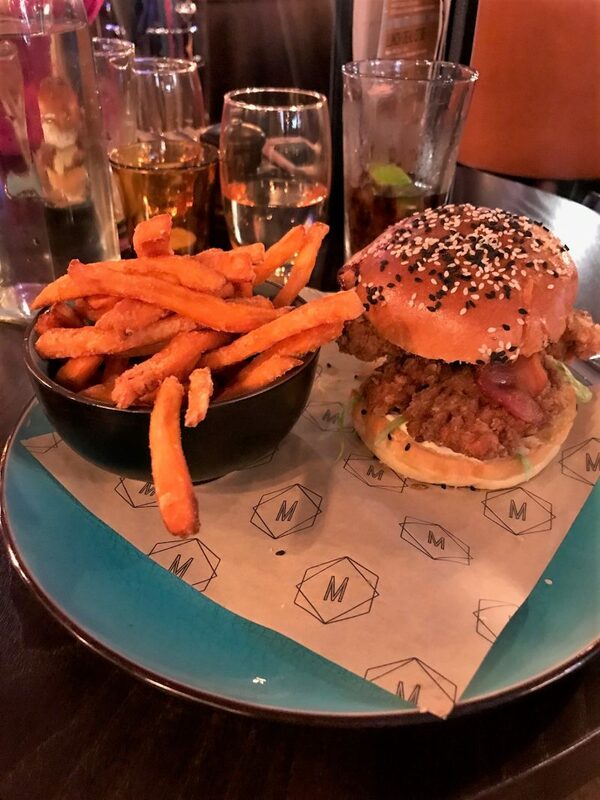 Couldn’t fault either burger, both great portion sizes, reasonably priced at around £11, but overall, I left being very impressed knowing I could return here and still be stuck for choice on what to order. 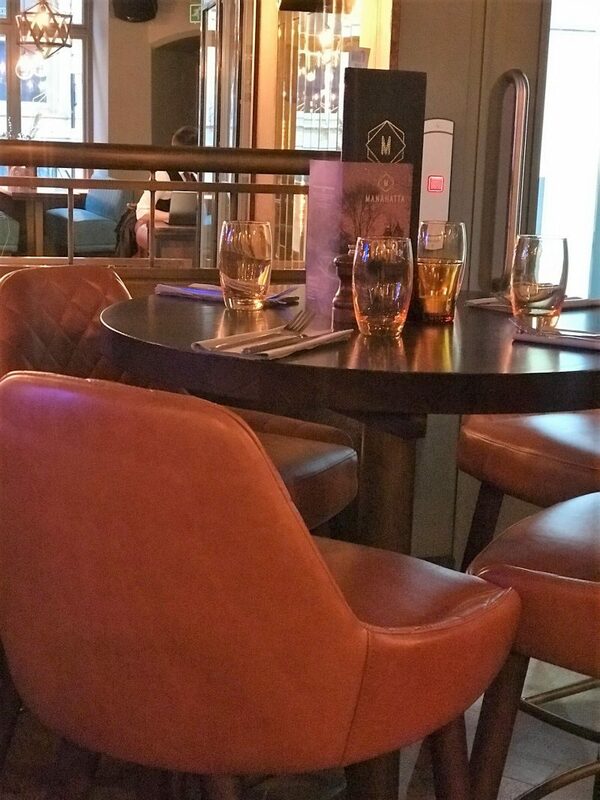 It really is a stunning place, and I could tell the team have worked hard to create the perfect ambience for Manchester diners and drinkers. 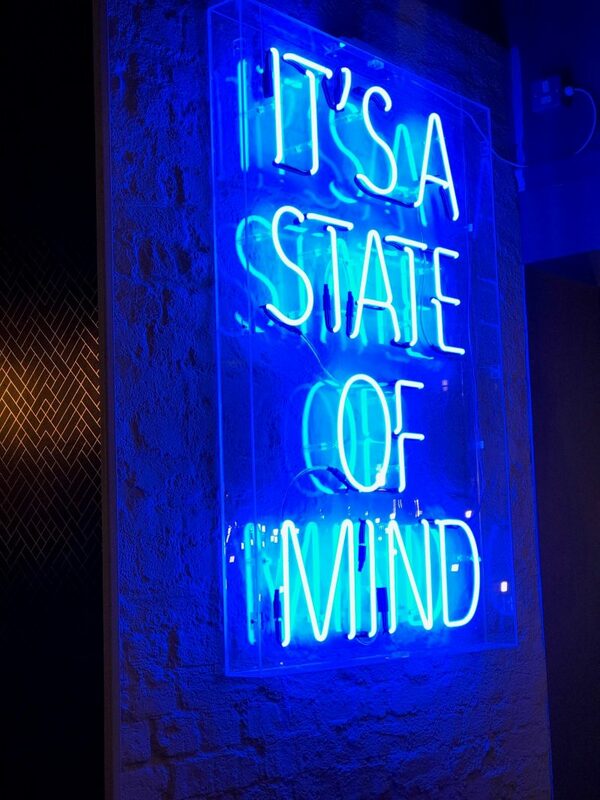 It really does have that vibe of a New York eatery, with it’s mirrored walls, flashing lights and low hanging bulb lights. 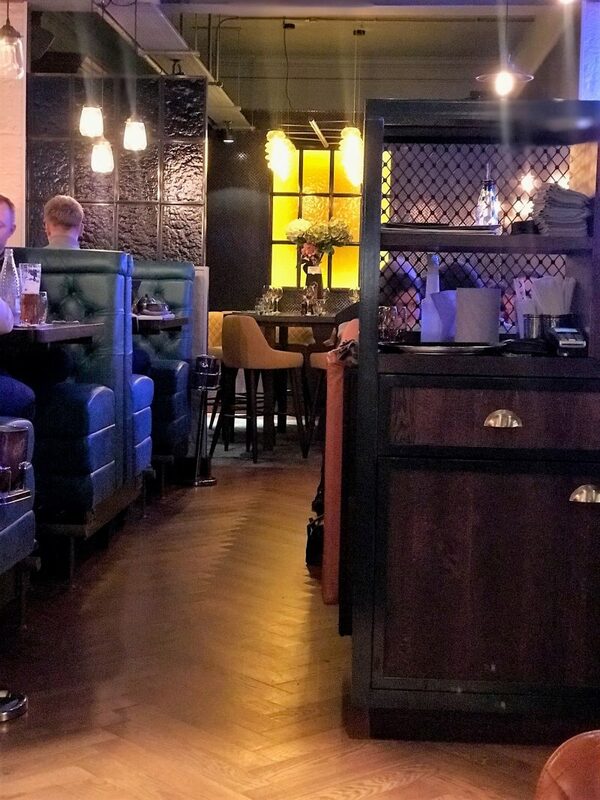 A great haunt to visit on lunchtimes or the evenings (and I’m assuming brunch, although I haven’t tried this yet!). Huge shout out to the team who looked after us. Extremely attentive, polite and speedy.